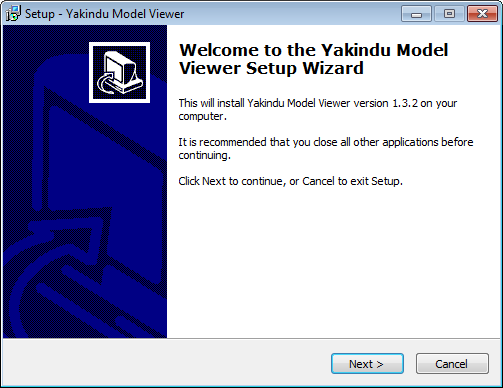 In order to start working with YAKINDU Model Viewer, you have to install the software on your computer. We are assuming you have downloaded the software installer already. The installation process boils down to executing the installer and following its instructions. YAKINDU Model Viewer is currently available for Microsoft Windows. Future versions will also support macOS and Linux. In order to install YAKINDU Model Viewer on Windows, execute the downloaded installer program YAKINDU_Model_Viewer_Setup_x64.exe. The installer will guide you through the installation process. 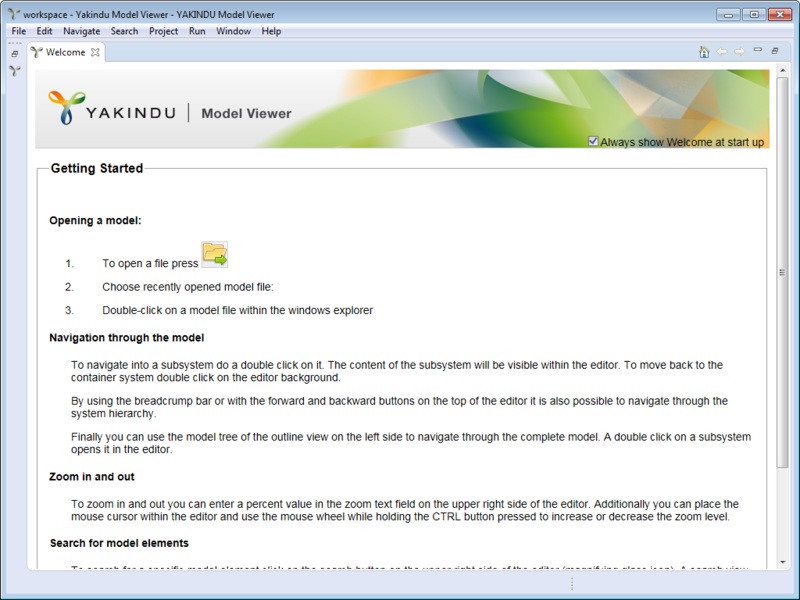 After successful installation, the installer will start the YAKINDU Model Viewer application. Select the Model Viewer entry in the Windows Start menu. 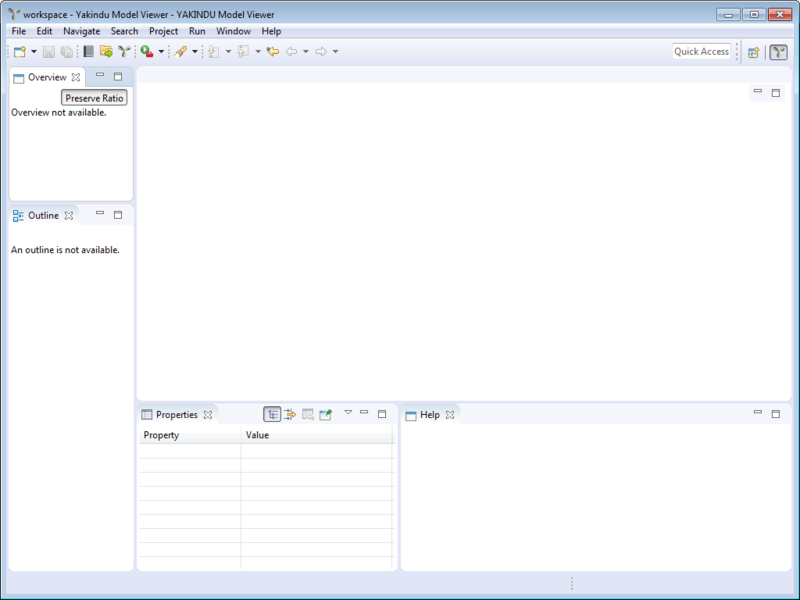 Double-click on a Simulink model file, having an slx or .mdl extension, in the Windows Explorer. YAKINDU Model Viewer will open the file and display the model. Double-click on the YMV.exe executable in the installation directory you selected during installation. After starting up, YAKINDU Model Viewer presents the Welcome window. It gives you a brief introduction to the most important features. To actually start working with the tool, close the Welcome tab by clicking on its resp. button. You can display the Welcome tab anytime again by selecting Help → Welcome in the main menu. If you don’t want YAKINDU Model Viewer to display the Welcome page each time you start it, uncheck the Always show Welcome at start up item on the Welcome page. This is your working environment. Congratulations, you have just installed and started YAKINDU Model Viewer! You can proceed now by installing a YAKINDU Model Viewer license or by opening and browsing your first Simulink file. The YAKINDU Model Viewer trial version comes with an evaluation license that is valid for 30 days. If you want to continue working with YAKINDU Model Viewer beyond that period of time you have to acquire a license. The license manager documentation describes how you can install a license file or configure a license server for floating licenses. To access that documentation, select Help → Help Contents from YAKINDU Model Viewer’s main menu, then open the YAKINDU License Management documentation.